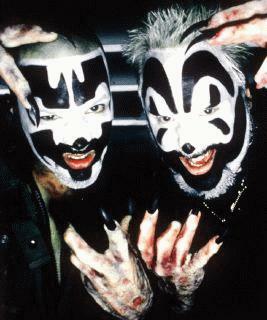 Insane Clown Posse Are Getting Their Own TV Show!!! All you juggalos are about to get extremely excited, so pop open a Faygo and enjoy this news. Violent J and Shaggy 2 Dope of Insane Clown Posse are getting their own TV show currently titled ‘Insane Clown Posse Theater‘ for the Fuse network. This will be a weekly half-hour series about the their bizarre take on pop-culture. This series is based on ICP’s web series that is still in production. The new show will premiere next month. I’m going to imagine this will be a cross between E!’s ‘The Soup‘ and ‘Mystery Science Theater 3000‘, but you know, with clown makeup, dead chickens, and blood. But after watching it looks like it will be a live-action Statler and Waldorf from The Muppets, complete with theater chairs and everything. When I first heard about this earlier today, I thought someone picked up ICP’s version of the Dating Game, based off their song ‘The Neden Game’ from their album ‘The Great Milenko’. Maybe they will have a spot on their new show for it. The Dawson To Star In ‘What Would Diplo Do?’!!! This entry was posted on Monday, June 10th, 2013 at 3:42 pm	and is filed under Music, News, Television. You can follow any responses to this entry through the RSS 2.0 feed. You can skip to the end and leave a response. Pinging is currently not allowed. « Check Out ‘Naked Girls Reading’ Banned Books This Friday! !